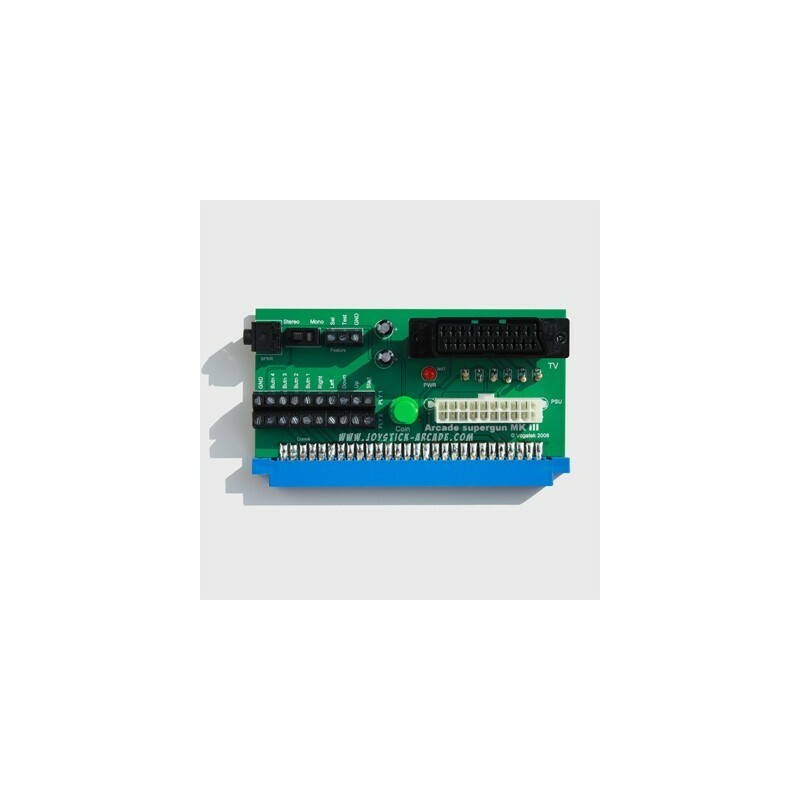 Arcade supergun motherboard para jogos JAMMA & MVS NeoGeo TV-out via Scart. Instructions and safety precautions ! 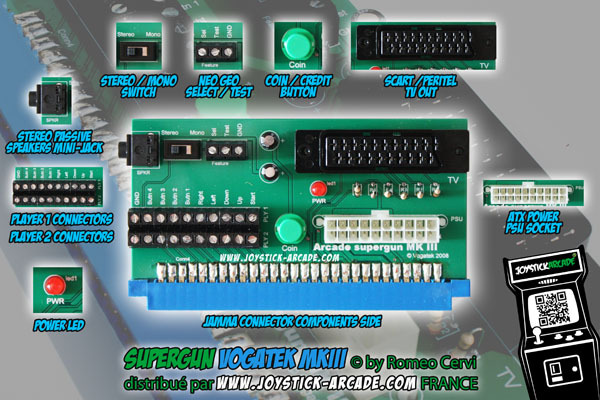 The Arcade Supergun MKIII is compatible with NeoGeo MVS motherboards and JAMMA arcade pcbs. 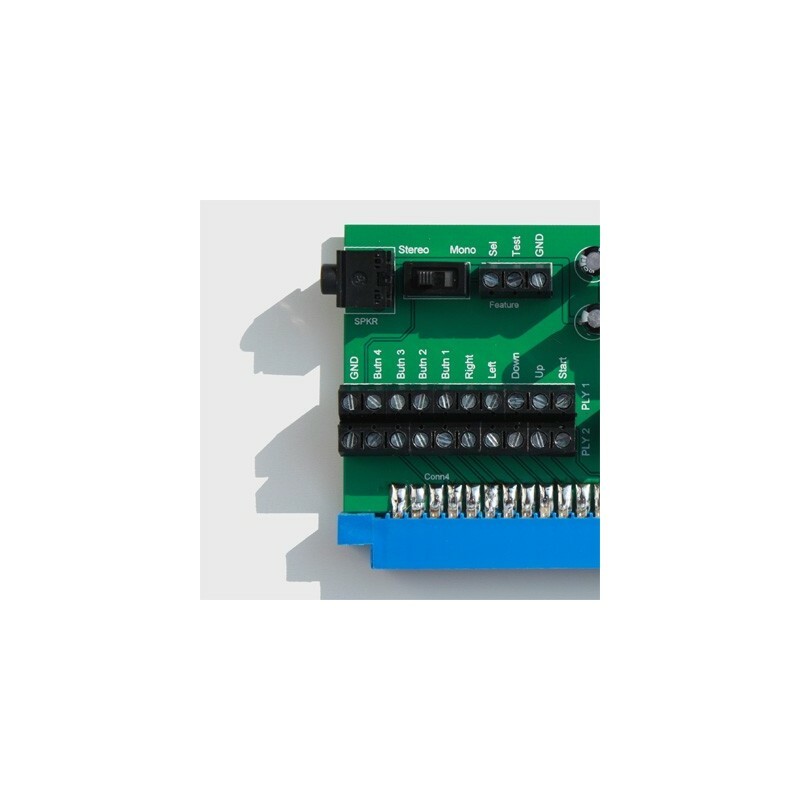 DC type microswitch arcade controls can be directly wired to the two 10 ways terminal blocks. The pcb legend identifies the connections. 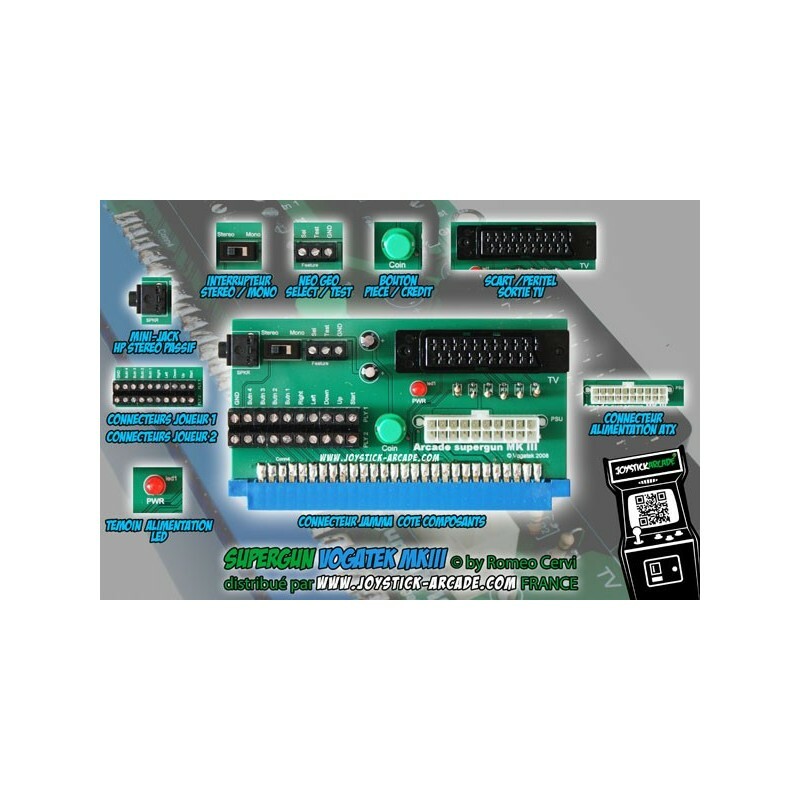 6 button games can be played. 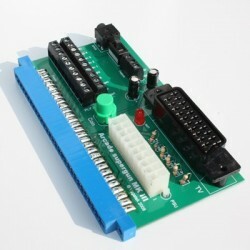 The gamer will have to directly connect the 3 kick buttons from the arcade pcb kick harness to the DC type arcade controls. 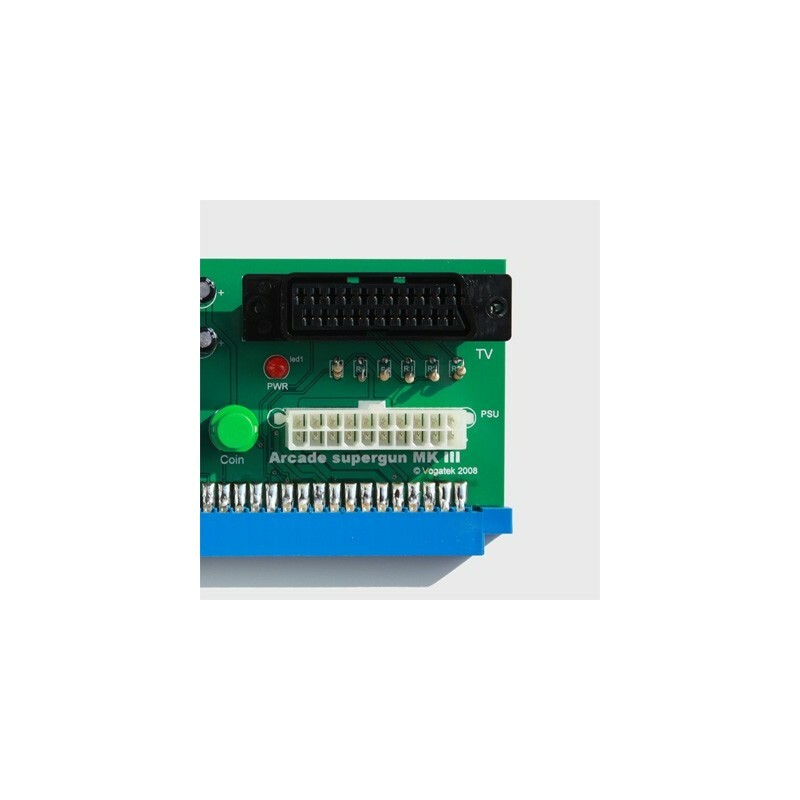 A 3 way terminal block has connections for NeoGeo ® select and test functions. 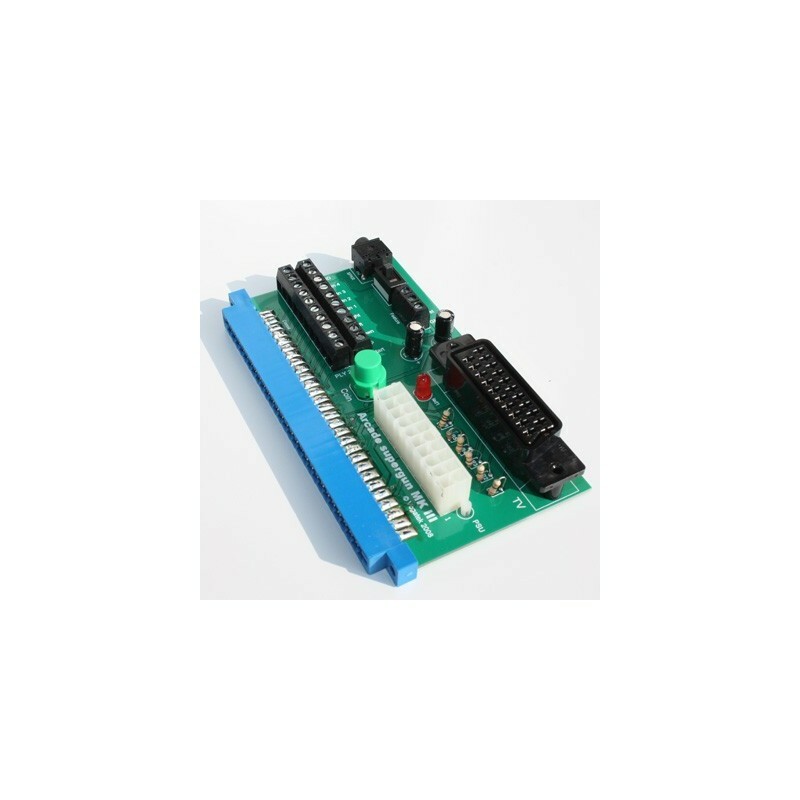 A Mono/Stereo switch is included to allow the gamer to select either JAMMA Sound which is Mono or NeoGeo ® sound which is Stereo. The video output is Scart which is manly used in Europe. It gives a higher quality picture than composite or S-Video. In some models of TV you may have to manually select the Scart channel by using the on screen display menu. You can use a wide range of passive speakers, from 2W to 15W but ideally we recommend you use Stereo passive speakers with a combinated speaker power of 10W and each speaker having 8 ohms impedance. You can use a wide range of ATX power supplies, from 250W to 600W but ideally we recommend you to use one with a 400W Power Rating and have an On/Off switch. 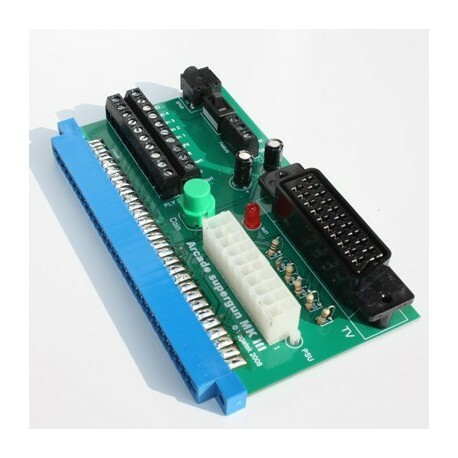 Please switch Off the TV and ATX power supply before changing arcade pcbs attached to the Vogatek MKIII arcade Supergun. A power surge on the TV set’s Scart socket could damage the TV ! 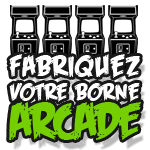 Arcade Joystick cannot be responsible or in charge for misuse / manipulation / modification of the Supergun motherboard.